More than five hundred attended this year’s action packed event and enjoyed a sprawling array of beer, wine, cider and liquor from eighty different vendors. All three levels of the impressive Pike Place Brewery were jam packed with excited attendees, great product samples and live music this past Sunday, February 9th. Upon entrance, each attendee was given tickets to sample the various beverages available and a commemorative glass filled with goodies. The energy of the evening was buzzing as people lifted their forks and glasses high for a great cause. 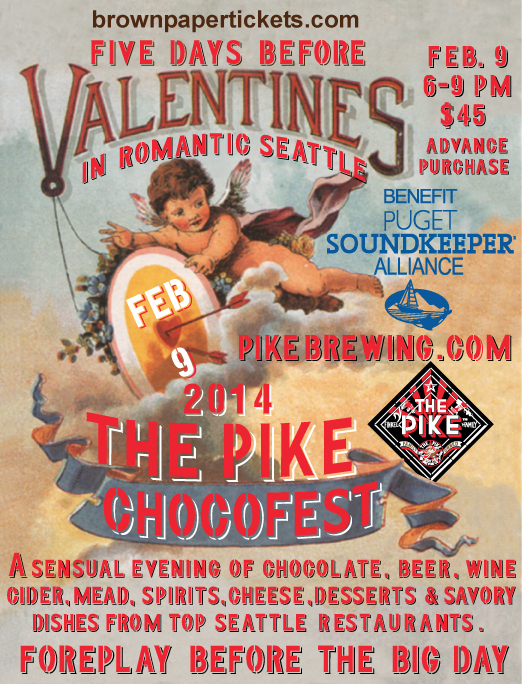 The vendors, including Pike Brewery, all had amazingly delicious offerings presented by knowledgeable professionals. The proceeds from Chocofest went to the Puget Soundkeeper Alliance, a local non-profit dedicated to cleaning up and keeping our waterways safe for future generations. This organization is really doing a wonderful job at combating the pollution of one of our most precious natural resources. The Pike Brewing Company is a shining star in the Seattle beer scene and continues to consistently produce great food and beer. You can visit the brewery and try one of their many delicious craft beers starting at 11am daily at 1415 1st Avenue, Seattle, WA 98101. Here are some romantic events happening tonight in Seattle and beyond for Valentine’s Day. Have a great V-day everyone, from all of us here at Brown Paper Tickets. Friday, February 14th | St. Valentine’s Day 3-Course Dinner – Seattle, Washington Seattle’s Fado Irish Pub are inviting couples down for a romantic three-course meal this Valentine’s Day in a warm and intimate atmosphere. Friday, February 14th | Valentines Day in Fremont’s Most Romantic Dining Room – Seattle, Washington Seven courses to amuse and delight (Chef Andrew Coker). Music to enchant (Guitarist Eric Friedrich). Drinks to intoxicate (Jayson Cottam’s delicious blends), Gifts to remember (featuring: Jay’s Elixirs, Bellefleur Lingerie, St. Germaine, Martini & Rossi, and premium local chocolates). Friday, February 14th | VALENTINE’S DAY RED CARPET EVENT – Federal Way , Washington Valentine’s Day benefit dinner show for House of Matthew’s homeless housing program for Veterans. Entertainment by Sea-town Rhythm & Blues Band. DJ Simply will be spinning plus there will be poetry, raffles and door prizes. Cookie Lee Jewelry will also be for sale with all proceeds going to the House of Matthew’s homeless housing program. Dinner choices include a gumbo dinner or a chicken dinner. The whole evening will be MC’d by Centrell Jackson. Friday, February 14th | 3rd Annual ARTE Y TAPAS Valentine’s Day! – San Francisco, California ARTE Y TAPAS is proud to announce their 3rd Annual Valentine’s Day Celebration and anniversary show tonight! Featuring live music by Whitney Myer, visual art exhibition by Artillery AG’s Alexa Treviño and Ivan Lopez – PLUS admission also includes sparkling cocktails, sangria, craft beer, local wine and a very special New Orleans-inspired tapas menu by Lovage Cooking! Friday, February 14th | Wine & Grill on Valentine’s Day at VIE Winery! – San Francisco, California Valentine’s Day is about love period. At VIE Winery, they feel it’s a day to celebrate love between friends and family as well as between two people. So, come spend Valentine’s in their tasting room tonight from 6-9.